Map showing location of Golden Springs Motel and Holiday Park . Use the controls on the map to zoom in and out. I booked well in advance as the ads I saw appealed, as did the thought of a natural hot stream. I specifically asked for linen as I was travelling from overseas and not carrying any of my own. I also booked in advance for a Saturday night for the restaurant. This was May 2013 and I booked in March. Plenty of time for them to have emailed me to tell me the restaurant had closed, which they didn't bother to. It was cold and raining when I arrived and the place looked spooky and deserted. The proprietors had gone on holiday leaving relatives in charge; the restaurant was shut (I had no food with me) but they offered to cook fish & chips or steak & chips for an extra $22 (no thanks). The cabin they booked me into was cold with no heating and NO LINEN, smelled musty and was old. I went back to reception and told them that I had specifically booked a room with linen provided and they "upgraded" me to a "motel" room which was $12 a night extra. As I was staying for 2 nights that was an extra $24, which I stupidly paid. I tried the room they gave me but because of the rain there was a 6" deep unavoidable puddle at the door, so I asked for a different room, this too had a puddle but a bit shallower. Inside was old-fashioned, with laminex peeling from the benches, a dripping shower which I could hear through the wall all night. At least the bed was comfy and there was an electric blanket and bed lamps. I had to drive up to Rotorua to get some food!! I decided to give up on the place the next day and took off to my next destination (Te Aroha). I did not want to make a fuss with the people there so I just wrote off the money I had paid. I would not recommend ANYONE to stay there. I didn't even go to the stream as the path was boggy and slippery. A real disappointment. Someone should buy the place and do it up because the general concept is good but the owners just could not be bothered. Would not recommend. Very run down. Booked 2 nights but only stayed 1night. Cabin was so close to main road every truck passing shook cabin so hardly got any sleep. Cabin extremely run down. Shower/toilet facilities very scruffy. Golden Springs is over 100years old and is absolutely quaint. It is a treasure from a time long gone. I had swims in the pools morning & night - the pumpice bottom one is lovely and warm. Unfortunately the trees by the main road have gone and the truck noise is terrible. In saying that I went back for another night rather than stay in Taupo. One day someone will get this treasure and hopefully restore it in keeping with the Mihi Store nearby. Last year my husband and I couldn't get into our favourite place - Waikite Valley and we saw Golden Springs advertised in the Jasons directory. Frankly, there are no words to describe our horror! I am so sorry that I booked online (and paid in advance for 2 days). Their marketing photos in the Jasons directory look like a different place. I believe they should be updated. This place is extremely run down - everything - the shop appears to be extinct and I couldn't see that the restaurant was operating. What they call "hot pools" appear to be sandfly/ mosquito infested holes and I couldn't believe people were actually sitting in them. I would be terrified of getting sick there. I heard the owner telling other people that "like all of these pools around NZ there are sandflies!" That is quite incorrect When we realised we couldn't stand the place (even for one day), we went over to Waikite Valley pools for a swim and didn't see a single sandfly. Golden Springs camping ground was quite a hot topic during our bathing at Waikite. We met one couple who said they'd paid $160 for a cabin only to find it had rotten walls and mouldy curtains. Somebody else said they had a mouse in theirs! Seriously, how can they charge people for the disgusting state of this camping ground. It should not be allowed to stay open - aren't there some standards required to be met. This place must give our country such a bad name. Don't go near it. What a rip off. This really taught me a lesson - not to book online if I've never checked out the place first. am letting you know that I wasn't impressed with our room 21 Motel Room we recently stayed in to attend a wedding at the River Lodge. Others in our group had bigger rooms for the same price I might add. Our room smelt old and musty with squashed mosquitos on the walls and in curtains and looked very tired. No phone and poky little mirrors one couldn't even get a full length view of how I looked for a wedding. Plugs scarce for appliances to do my hair, limited lighting and to top it off my husband couldn't believe I had paid $125 a night for this standard of accommodation. How can you justify charging that much. We would have been better off travelling the extra distance and staying somewhere half decent in Taupo. I seriously think you need to look at your prices and make some major makeovers if you expect people to pay that price. We have stayed in many motels throughout NZ and this would have to be the biggest rip-off ever. I am contemplating on advising the River Lodge our thoughts as they may want to reconsider recommending your accommodation. My husband reckoned $80 would have been adequate for what we received. Amazing place to stay!!! me my partner and four children had a wonderful time, hot pools were great got to feed the ducks and soak in the atmosphere.Lovely owners and a place to enjoy each others company surrounded by serenity first place ive been to where families are encouraged to have so much fun and not looked down on!! (parents know what i mean) Clean and tidy just wat me and the kids needed.Cute little village too. I would advise people to check the standard of cleaning before paying for your room. This is an older motel (which is fine), however the cleanliness leaves a lot to be desired. Mouldy shower, old and dirty toilet seat, rubbish in drawers, dust balls etc. Also the dairy/takeaway next door (as described in their website) is no longer there. You have to travel into Taupo or Rotorua for supplies. I would think twice before booking in here. For the price of the room, you will get a far higher standard by staying in Taupo or Rotorua. Great family destination for several days. 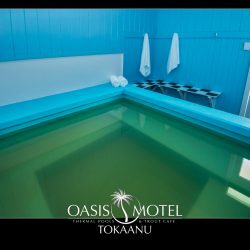 well located between Taupo and Rotorua to do day trips without having to move accommodation. Plenty of free things to see and do in the area, and they allow pets.